The world’s leading critical communications congress and exhibition heads to Hong Kong. Critical Communications World (May 16-18, Hong Kong) is the leading and most influential congress and exhibition dedicated to connecting critical communications professionals for three days of thought provoking discussion, debate and networking. Hosting this year’s 19th Annual event in Hong Kong provides the perfect setting, with this year’s theme focused on network optimization and transition. With many areas in Asia and indeed across the rest of world looking to get the most of their current networks as well as understanding how they can smoothly transition to networks offering more functions, this year’s conference will attract senior thought leaders from all major projects to share their experiences and insight to meet the demands of the modern end user. Critical Communications World will also provide free content for visitors on the show floor, featuring two high level seminar programmes and zones dedicated to Future technologies and Data apps & control rooms providing you with the opportunity to hear from end users and leading solution providers alike on the latest technology application case studies. 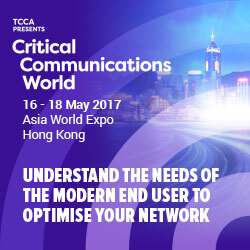 Phil Kidner, The Tetra and Critical Communications Association (TCCA) CEO said: “I am delighted that CCW is returning to Hong Kong. Both personally and professionally I regard Hong Kong as a great city. I have already had the pleasure of meeting with the representatives of many of the critical communications networks. Their enthusiasm for this event is infectious. I am certain that they will help us make it the best CCW ever! Hong Kong is a hub for Asia and beyond, so I expect to see the widest variety of delegates with whom you will have numerous networking opportunities to learn from their experiences – those that currently use analogue networks, those that use TETRA and other standard PMR networks and those that are looking for broadband solutions. Critical Communications World 2017 is presented by TCCA, in partnership with KNect365. This year’s major sponsors include Airbus, Huawei, Leonardo, and Motorola Solutions (Gold Sponsors) and Cobham, General Dynamics and Nokia (Silver Sponsors). Critical Communications World attracts 3000+ attendees and is the flagship event in the world leading Critical Communications series. The event is presented by the TCCA, in partnership with KNect365 TMT. Informa’s Knowledge & Networking Division, which operates as KNect365, is the world’s leading facilitator of knowledge sharing and business connections. The KNect365 portfolio provides digital content, memorable face to face experiences, networking, and professional development and learning. Operating in key industry verticals, including finance, life sciences, and technology, they provide the highest-quality content and thought leadership alongside platforms for connecting and collaborating, giving our customers real advantage.